If you are looking for some guidance to help you understand this ‘Know Your London’ Website, then this is the page at which you should start. It will explain how to find your way around all the blogs. Above: Map of Inner London. The City of London is coloured RED. Westminster is coloured YELLOW. 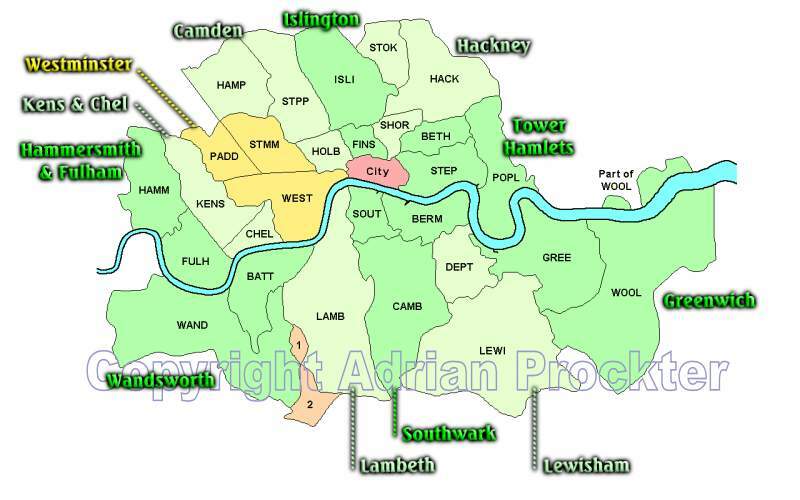 All the other Inner London Boroughs are coloured in one of two shades of GREEN. The Inner London Boroughs are named around the edge of the map in matching colours. The original Metropolitan Boroughs are shown within each London Borough. The City of London was founded by the Romans – they called it Londinium. By Norman times it was known as the ‘City of London’ and still has the same name today. To the west of the City of London was the City of Westminster but it did not acquire that name until the 16th century. The original Westminster was centred on the Palace of Westminster, now better known as the Houses of Parliament. Around the City of London and the City of Westminster was once open countryside, with a few scattered villages (like Camberwell, Eltham, Hampstead and Islington). By the 1800s most of the villages had expanded, due mainly to more and more people choosing to live in and around London, and they were starting to join up as the urban sprawl continued to grow. In 1900 an area around the two original cities was defined as Metropolitan London. It extended west to Hammersmith, north to Hampstead and Highgate, east to the River Lea (on the north side of the Thames) and to Woolwich and Plumstead (on the south side of the Thames) and south to where Crystal Palace Parade is now. Within the area of Metropolitan London, the City of London remained as a separate unit. Around it, 28 Metropolitan Boroughs were created. They existed from 1900 until 1965 when the 28 Metropolitan Boroughs were combined (in groups of twos and threes) to form the 12 Inner London Boroughs that exist today. The blogs are organised by Metropolitan Borough. The Categories listed on the right-hand side of every Webpage allow the reader to pick out a variety of topics. The first topics in the long list start with a ‘forward-slash’ (/). Below them are those starting with a ‘zero’ (0). Following on are numbered topics (numbered ‘1’, ‘2’, ‘3’ and ‘4’). – this Category lists the general blogs about the City of London. To help understand the different parts of the City, there are also 13 Categories which describe the City by one or more City Wards. They are listed below. This Category lists blogs with general information about the City of Westminster which is also another Inner London Borough. The original Metropolitan Borough of Westminster is divided into the five areas listed below with a star (*) for the purpose of study on the ‘Know Your London’ Website. In 1965 two more Metropolitan Boroughs (Paddington and St Marylebone) were combined with the old Metropolitan Borough of Westminster to form the new London Borough of Westminster. On the ‘Know Your London Website’ the present London Borough (known as the City of Westminster) is divided into seven areas of study. Rather confusingly, the old Metropolitan Borough of Westminster and the new London Borough of Westminster were not know by those names. They were instead both known as the City of Westminster. – Paddington was created in 1900 as the Metropolitan Borough of Paddington (one of the original 28 Metropolitan Boroughs). In 1965 Paddington was added to the City of Westminster. – the land includes the street called Piccadilly, Hyde Park, most of Kensington Gardens and the areas known generally as Soho and Mayfair. – the land to the south of the street called Piccadilly which comprises St James’s Street, St James’s Square, St James’s Park, Pall Mall and Buckingham Palace. – St Marylebone was created in 1900 as the Metropolitan Borough of St Marylebone (one of the original 28 Metropolitan Boroughs). In 1965 St Marylebone was added to the City of Westminster. – the land centred on the street called Strand. – the place-name ‘Westminster’ in medieval times just meant the land around the Palace of Westminster (better known today as the Houses of Parliament). So, this piece of land relates to the land just mentioned as well as what is generally known as Belgravia and Pimlico. – the land around Horse Guards Parade which was once known as Whitehall Palace. The City of London has always been a separate administration. It was not one of the 28 Metropolitan Boroughs. From what has been said, it will be realised that the London Borough of Westminster (actually called the City of Westminster) was derived from three of the 28 Metropolitan Boroughs – Westminster, Paddington and St Marylebone. We, therefore, have to account for the remaining 25 Metropolitan Boroughs (Shown below in BLACK). They were combined (in twos and threes) into the other 11 London Boroughs (Whose names are shown below in RED). Any additional notes are shown in GREEN. – Clapham was, before 1965, in the Metropolitan Borough of Wandsworth. After 1965 it was moved to the London Borough of Lambeth. – Streatham was, before 1965, in the Metropolitan Borough of Wandsworth. After 1965 it was moved to the London Borough of Lambeth. Just a very few blogs are written for places in Outer London. This is only done where the subject relates to Inner London. The Outer London Boroughs are listed below. In the list of Categories (on the right-hand side of each page), there are various types. / Those starting with ‘/’ identify the part of London that they relate to. 0- Those starting with ‘o-‘ identify small areas in London with a strong identity. These small areas are part of an area which starts with ‘/’. 1- Those starting with ‘1-‘ identify topics which are in common with several areas of London (like ‘Regent’s Canal’ or ‘Roman Wall’). 2- Those starting with ‘2-‘ identify surnames of persons connected with London (like ‘Wren’). 3- Those starting with ‘3-‘ identify the names of organisations and groups of people connected with London (like ‘Jews in London’). 4- Those starting with ‘4-‘ identify subjects (like ‘Markets’ or ‘Parish Markers’). You are now ‘up to speed’ with how the system works. Good luck with your searches. This Website is constantly being added to at the rate of three blogs each week. Each blog is usually filed under at least one Category starting with ‘/’. Sometimes a blog carries other Categories.